We nearly didn’t see Gregory Porter. I’d booked our tickets in July last year and, as the April date grew imminent, I realised I’d noted the date incorrectly. I’m so glad we didn’t miss out. It was a privilege and a joy to experience an evening of beautiful jazz delivered by the soul man. Nashville-based singer/songwriter, Kandace Springs, opened the concert. Showcasing songs from her new album, Soul Eyes, she also shared a beautiful cover of Roberta Flack’s The first time ever I saw your face. Porter’s band took the stage to an enthusiastic welcome. Pianist, double bass player, saxophonist, trumpeter, Hammond organist and drummer welcomed the nattily dressed, hat-wearing gentle giant to the stage with beautiful music. Gregory Porter opened with Holding On from his upcoming new album, Take Me To The Alley. When the audience responded with appreciative applause and whistles, he introduced his band. Throughout the evening, he shared the stage generously with his band. He stepped out of the spotlight at every instrumental solo, and never failed to show appreciation for his band. And so he should – they were a superb match for his liquid velvet voice. On My Way to Harlem was his second number. Porter clicks his fingers through every song, feeling every beat, every nuance, every note. After some gentle scatting, he brought the number to a close, before moving on to the beautiful Illusion. “There’s a lot of trouble in the land,” he reflected, before introducing his next number. “At the end, feel free to join in with me. But not until the end. I love you, but I don’t want to hear you,” he said. The son of a preacher mother took us to church and brought us back into the room with No Love Dying. We joined in at his command – at the end – and he seemed pleased with our performance. He encouraged us to clap to the rhythm of our hearts in Liquid Spirit. Porter moved across the stage, taking his mic stand with him. The song featured an insane piano solo, and an equally insane drum solo. The lyrically and melodically exquisite Hey Laura followed, before another clearly personal track from his new album, Don’t Lose Your Steam. If the bridges fall down, don’t lose your head of steam. As Porter sat down next to the piano, the rest of his band left the stage. “This next one is called … whatever I feel like,” he said. He chose the very poignant and beautiful Don’t Be a Fool, which he and his pianist presented with intimacy and tenderness. His band returned to the stage, and his very smiley double-bass player opened the next number: a rousing and soulful cover of Motown’s 70s hit – Papa Was A Rollin’ Stone. Musical Genocide, again with an extraordinary piano solo, and The Consequence of Love followed. Porter, tall and with a towering presence, never hogs the limelight. He appears to revel in the talent of every band member; he feels and appreciates every note. After another cover – Nat Adderley’s 1960 Work Song, made famous by Nina Simone – followed the moving story of Be Good. This brought with it an outstanding and beautiful sax solo – delicate, sultry, sublime. An astonishing trumpet solo in 1960 What? – the song inspired by Porter’s own stories of life in Detroit, as well as Martin Luther King’s assassination – brought the concert to a close and the audience, screaming and whooping to its feet. Porter again acknowledged his band, said “God bless you,” to the audience, and walked off the stage. He came back with the energetic Be Free. He sang his gratitude to the audience and hoped we’d felt the love. He bowed, waved to us and walked off the stage, leaving his band playing. Starting with the pianist, each band member took it in turn to play solo before walking off the stage. The double-bass player – now on an electric bass guitar – and the drummer challenged each other to a musical duel, before the guitarist left the stage with guitar flung over his shoulder. The drummer held the stage for a further five minutes. He teased us by pretending several times to stop playing, and then continuing his awesomeness. When he eventually stopped, put down his sticks and sauntered off the stage, the audience went crazy. Singing his stories of love and pain, woah. Thank you, Mr Soul Man, for holding us all in the palm of your hand for the evening. What an outstanding band, an awesome concert. Woah! Sunshine in London signing off for now. “I’ve got sunshine, on a cloudy day,” is playing on the radio as I write. It’s grey and miserable and wet and cold in London today. The song is perfect encouragement for me. So back to our weekend. After our delightful breakfast in Bethnal Green on Saturday morning, we went to Greenwich to show our friend the market and the wonderful second-hand record shops. 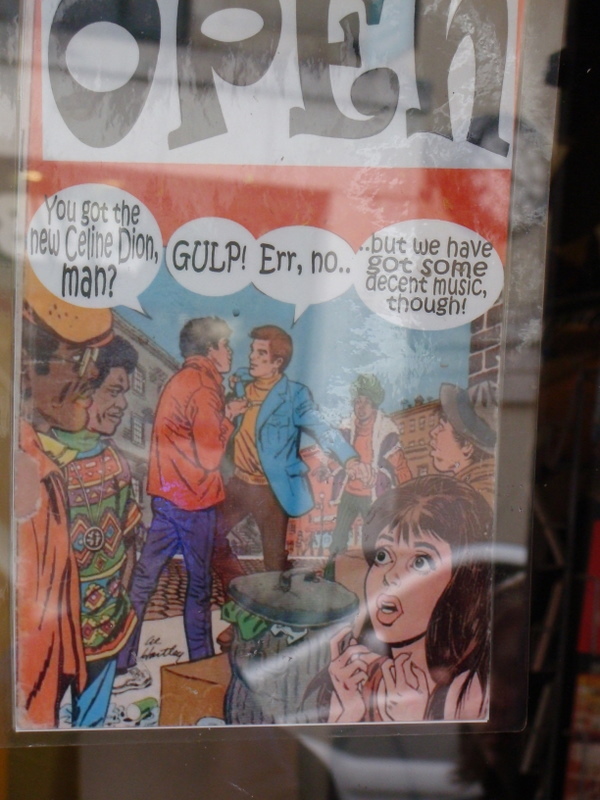 The first record shop we went into had this poster on its window – there’s a bit too much reflection in the photo, but it’s clear enough to show you the message. Sorry to all the Celine Dion fans out there … nothing personal! Promise. So this was a great record shop! My husband and his friend were lost in old records and memories, and moved on from that shop to another that has two levels of second-hand sounds. Wall to wall records and CDs … heaven, indeed! After a good old bogle, we moved across the road to Greenwich market. The market in Greenwich dates back to 1700, when the Royal Charter Market was assigned to Greenwich Hospital for a thousand years. It has moved site since then and over the years has grown and evolved into the arts, crafts and food market that it is today. You can buy anything from a divinely iced cup cake to a leather handbag, jewellery, clothing, second-hand books, Italian nougat and a hat. Flanked by vintage clothing stores, pubs, coffee shops and toy shops, there is also a fabulous food section in the market where you can buy any kind of food from curries and Turkish wraps (our absolute favourite!) to cakes and sweets. One of our favourite things to do is to go there after church on a Sunday, pick up a Turkish wrap and then go and walk through Greenwich Park, venturing up to the Royal Observatory if we have the legs, or just relaxing on a bench or on the grass. It’s always lovely there, and if you do walk up the hill, you can see just how curvy the Thames is. I look forward to going there when it’s snowing and watch the tobogganers speeding down the hills. Earlier this year, a few English bobbies were reprimanded for tobogganing on their shields (somewhere in Oxford, I think). I loved that story – they just couldn’t resist the thick snow and they had perfect makeshift toboggans! On Saturday night we took our friend to the Vortex Jazz Club in Dalston, north London, to see Britain’s finest jazz singer, Ian Shaw. Despite getting slightly lost en route there (our trademark), we got there good and early and sat and had a drink in the pub downstairs until the doors opened. We went upstairs as soon as we could, and waited for the great muso to arrive and start his show. He was just fabulous. He sang a few of his Joni Mitchell numbers – mashing Edith and the Kingpin together with Big Yellow Taxi, Talk to Me and a wonderful mix of River and A Case of You. In between he delighted with Stuck in the Middle With You, Bowie’s Ch-ch-ch-changes and a beautifully poignant Alone Again, Naturally that brought me to tears. Ian Shaw, jazz singer extraordinaire. When we were waiting downstairs before we went in, we saw a huge posse of youngsters arrive, all dressed in matching tracksuit tops, and heading towards the Club. The Club is pretty small and we couldn’t imagine that they could possibly be going to see Ian Shaw. Where would they sit, and why would youngsters – apparently on a school trip – want to go to an evening of jazz? Turns out they were a big band from a school in Finland and were obviously mad-keen musicians. I felt quite ashamed of my assumptions, and listened in awe as a handful of them scatted along confidently at Ian Shaw’s nod, and one took out his saxophone and, with perfect attitude and flair, accompanied Ian Shaw’s intuitive piano playing. I was humbled and oh so impressed. Ian Shaw took a few requests, and generously sang Baghdad Cafe, mixing up a hilarious snippet of Kate Bush’s Wuthering Heights in the middle. An absolutely fabulous version of Al Wilson’s The Snake led him to the perfect closing number in Shirley Horn’s Here’s to Life. A beautiful conclusion to an exceptional day. No complaints and no regrets. I still believe in chasing dreams and placing bets. But I have learned that all you give is all you get, so give it all you got. To see what’s down another road, beyond a hill and do it all again. So here’s to life and all the joy it brings. Here’s to life the dreamers and their dreams. Funny how the time just flies. To keep your winters warm. There’s no yes in yesterday. And who knows what tomorrow brings or takes away. For laughs, for life, for love. Here’s to life, the dreamers and their dreams. And all that’s good get better. Here’s to life, here’s to love, here’s to you. There is nothing quite like a walk along the South Bank on a lazy afternoon. After watching the buskers and street artists at work, take a few moments to browse through the books at the outdoor book market. Round it off with a free concert at the National Theatre, and you have another reason to love London. We’ve spent a few afternoons, usually with visitors to London, wandering along the South Bank, a walkway next to the Thames. We have watched jugglers and street dancers, street artists and musicians, statue artists (or whatever they are called) and a London bobby in a tutu. It is so vibrant along there. There is true talent on show and some talent just along for the ride, and it is all wonderful entertainment. A bobby in a tutu. I think he's off duty. Recently we stood and watched a busker blowing giant soap bubbles into the air. They were massive bubbles, boasting rainbow reflections as they floated into the air before being stabbed to death by pimply adolescents. We noticed a family standing across the way from us and soon became transfixed by their little, curly-haired, blue-eyed toddler in a buggy. He was so excited by the bubbles; his legs went rigid, then he screamed and laughed and kicked his legs in a frenzy. It was so sweet to witness pure, unadulterated joy and excitement. A precious moment. You cannot walk along the South Bank without stopping to check out the book market. It nestles under Waterloo Bridge and I understand is the only established second-hand/antique/vintage book market in southern England. It stays open till 7pm daily and is well worth a good browse; I saw some old Billy Bunter books there, something I haven’t seen since my childhood. Many of the traders are book specialists who can help you if you are looking for something in particular. The South Bank is lined with restaurants and culturally populated with theatres and galleries: the Royal Festival Hall, the Queen Elizabeth Hall, the Hayward Gallery, the National Theatre, BFI Southbank, Shakespeare’s Globe and Tate Modern. The London Eye is also there; a relatively recent addition to London’s skyline. The National Theatre quite regularly hosts free concerts in the foyer, and we have been privileged to see some up-and-coming and established artists performing there. One Sunday, after a long walk over a number of the London bridges (material for another day), we stopped at the National Theatre and were lucky enough to see a young singer/songwriter, Callaghan, performing in the foyer. Her musical idol is Shawn Mullins, so you can imagine that her style is acoustic country, folk music. Callaghan plays guitar and piano, and shifted between the two as she shared her wares of beautiful, lyrical songs of joy, triumph, love and longing. She chats between songs and is refreshingly open and honest, self-effacing even. We went to a second, free concert of hers there just before Christmas last year, and walked along the frozen South Bank, decorated with a brightly-lit German market, to get there. Beautiful, magical, colourful Christmas on the South Bank. We went to a third concert of Callaghan’s in July. It was a farewell concert of sorts, as she and her husband were about to leave for the USA, for her to fulfil her dream of making an album with Shawn Mullins. As we speak, she is touring with him in the US; check out the tour, you might want to go if you’re nearby. Her farewell concert was at the 100 Club in Oxford Street, central London. Described as the oldest live music venue in London, the club opened in 1942 as a jazz club. During World War II it saw the likes of Glen Miller perform there and, because it is situated in a basement, it was promoted as a bomb shelter of sorts. You could listen to great jazz music while the bombs rained down all around London. “Forget the Doodle bug – come and Jitterbug” was its payoff line in those days. Callaghan performed her set of beautiful songs, shared her story of coming to London and trying to make it in the music business while working as an admin assistant in an accounting firm. Moving to the USA was to be her plunge, full-time, into the business, and she was thrilled and excited. And she was beside herself to have Shawn Mullins agree to produce her album. She was accompanied in a couple of songs by the most outrageously talented jazz pianist, Joe Thompson. A pianist, artist and arranger, he is the musical director at London’s The Ivy Club. I am out of words to describe his talent. I was mesmerised. I feel so privileged to witness the birth, the breath and the expression of talent in this city. Artists clamour to perform here, to ‘make it’ here and to launch their careers here. Some never want to leave. I cherish the opportunity I have to watch and listen, to whistle and scream, and always to walk alongside the river. Sunshine signing off for today. We battled public transport. We crossed a bulging river. We ran the gauntlet of a cussing hobo. But we got there. And it was worth every ounce of blood, sweat and tears to get there. Ian Shaw is one splendid jazz singer. My music-mad husband has this thing about Joni Mitchell. He loves her music, her lyrics, her everything. A while ago he discovered that Welsh jazz singer, Ian Shaw, had made an album entirely of Joni covers. So he bought the album. And now he has a bit of a thing for Ian Shaw. Not really, but kind of. Ian Shaw lives in London and one of his favourite venues to perform at, we have discovered, is the Vortex Jazz Club in Dalston, north London. We bought tickets for his Saturday night gig there earlier this year. Being the weekend, the usual tube routes were disrupted, so our only option was to travel by bus. As we always do, we allowed ourselves an extra hour to get there. Buses were late, diverted and voluminously far apart. We resisted every urge to turn round and go back home again, but we eventually got to Dalston and walked and walked and walked. We turned around and walked back the way we came and discovered the road to the club was right next to the bus stop where we’d alighted. We turned down the road, and saw the lights of the club. It lifted our hearts and we hoped we hadn’t missed the entire show. Our final hurdle was to walk past a dodgy, tatty and foul-mouthed homeless person who drank from his brown paper bag and called me a word I don’t even like to think. The evening was not turning out the way we’d planned. We got upstairs to the jazz room an hour and a half after his show was due to start. We discovered that Ian Shaw had not. Yet. Begun. His. Show. Woohoo! We sat at our table, exhaled, ordered two tall, chilled glasses of wine and Ian Shaw walked to the piano. Our timing, as it turned out, couldn’t have been better. The Vortex Club is a small, intimate jazz club with a raised platform at the front with a grand piano on it. The rest, as they say, is music. We got treated to about two hours of fabulous entertainment. An accomplished, award-winning and crazily talented jazz singer, Ian Shaw opened the show with his version of Joni’s Coyote . Sublime. He then sang his way through a mix of songs from Joni (including a stunning cover of A Case of You – one of my favourite Joni numbers), Elvis Costello (Shipbuilding) and some songs he had penned himself – achingly honest and angst-ridden and wonderfully lyrical. It wasn’t surprising to learn that Ian Shaw used to be a stand-up comedian. The witty banter between songs was brilliant. We laughed so much and it felt like we’d been treated to a double act. You had to be there, really, but his list of reasons for wanting to lose weight made me laugh till I ached. He’s something of a national treasure. And such a pleasure to listen to. He loves performing locally and is a regular at the Vortex Club. We’re going to see him again next month. Only this time we’ll travel there on the new overground train. And this time, you’d better watch out, Mr Hobo – shake your filthy mouth at me and I’ll give you something to drink about!